These prices are valid until 31st December 2019. We charge per person rather than per room so we don’t discriminate against single people but charge a £5 per night supplement for a single person requesting a double bed rather than a single bed. 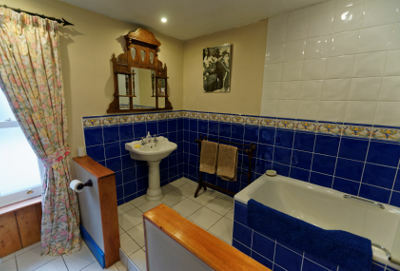 We have two en-suite rooms, both featuring an ensuite bathroom with shower, washbasin and WC. We have an attic room (above) with a television and settee, and a view across the fields towards the Menai Strait and Anglesey. The stairs are quite steep so this room is unsuitable for people with mobility issues. 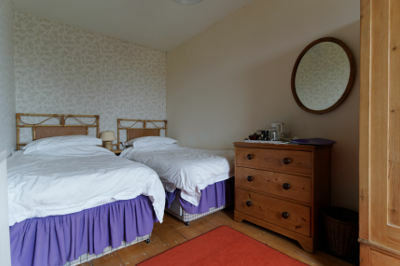 We also have an en-suite on the first floor (below), a pretty room with oak furniture but without the west facing view. 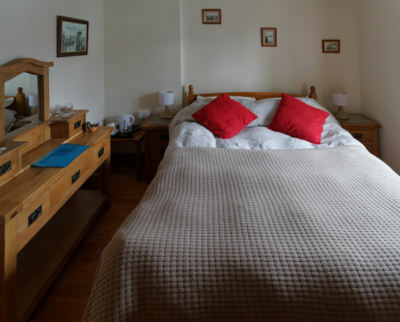 A large room with splendid views across open countryside to Anglesey and the Menai Strait. 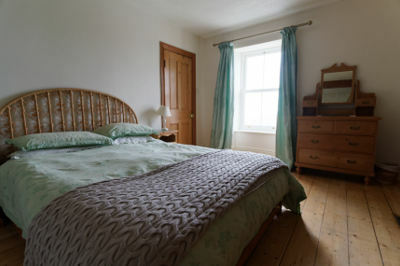 It features an original Victorian tiled fireplace, beams and a kingsize pine bed. This room shares the large bathroom with the twin room. This small pleasant room shares the same views to Anglesey as the double room and features stripped pine floor and furniture. 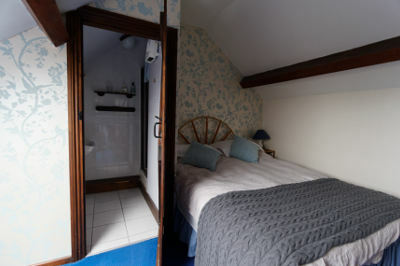 It shares the large bathroom (below) with the double room. We can provide packed lunches at a cost of £5.50 per person, these need to be booked by the previous evening. Under eleven years old half price. Eleven to thirteen three-quarter price. We don’t have credit card facilities, we accept UK cheques or cash. We are Europeans, we also accept Euros at the prevailing exchange rate. A deposit of £20.00 per room (non refundable) is requested on booking. Please make cheques payable to Christine Slater. If you require an acknowledgement, please include either your email address or a stamped addressed envelope.